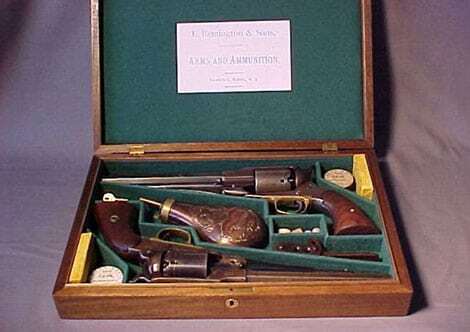 These gun cases are reproductions of cases that were manufactured by Colt contract suppliers in the 1850's, 60's and 70's. The interior designs and the finish are copied from cases that I have researched over the past 15 years. I have also duplicated the lock, hinges, lock plate, and even the style of inletting. Cloth colors are a match of the original Colt colors.